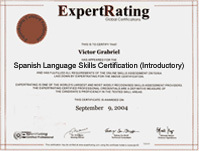 (leading to ExpertRating Spanish Language Skills Certification (Introductory)). Imagine yourself speaking, reading and writing Spanish. Now you can with Speed Spanish! This course is designed for anyone who wants to learn Spanish pronto. An Intermediate and Advanced version of this course is also available. Any of these courses can be bought collectively or individually for $129.99 each. Buy the Intermediate Spanish Course. This course includes a knowledgeable and caring instructor who will guide you through your lessons, facilitate discussions, and answer your questions. The instructor for this course will be Dan Mikels. About the ExpertRating Online Spanish Course instructor : Dan Mikels is a college instructor who has been teaching Spanish for more than 20 years. He holds a Master's degree and has authored and coauthored more than 20 educational products, including Speed Spanish, Fast French, and a variety of reading programs. Online Spanish Course requirements: For taking this instructor led ExpertRating Online Spanish Course you need Internet access, e-mail, and the Microsoft Internet Explorer or Mozilla Firefox Web browser, and a computer equipped with working speakers or headphones. "Although the amount of vocabulary was overwhelming, we were told to not worry because the most important thing was the recipes. Boy was he right. His "recipes" really helped me get the language into a recognizable form, so-to-speak. I will continue to study the lessons for quite a while even though the class is over. I feel confident with the foundation he has given us. I also look forward to Speed Spanish II." "A novel approach and very effective." "Dan: Great course & approach with the recipes. I've had several 'traditional' classes, which certainly gave me a good base, but my ability to put sentences together has improved by leaps & bounds. Muchas gracias!" "Enjoyed this course very much. Hope there will be other language courses. Thanks"
"Fit my time period. Met my needs. Feel more comfortable with the language." "Great class! Great tips on the easy way to speak Spanish. I wonder why high school Spanish teachers make it so hard." "I am a nurse at the hospital interacting with a lot of Hispanic patients weekly. Although I do speak enough Spanish to get by, I was interested in increasing my grammatical skills as well as my vocabulary. I was pleased to find each lesson added to my base as well as improved what I have been trying to do. The lessons were very easy to follow. Being able to work online at my own pace and schedule was perfect. Thank you." "I enjoyed the personal touch to the story in the lessons! I really liked this course, as it conveyed plenty of vocabulary in a short period of time, which I have not previously experienced with other spanish courses, books, or cassettes." 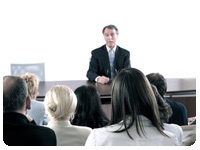 "I have already recommended this course to several people. I would like to know if there is a more advanced course available? I really enjoyed learning this way." "I have been trying to learn Spanish for about 20 years...this is the first course I have taken in Spanish that made complete sense to me! Thank you!" "I have encouraged Dan to create Speed Spanish 2 and 3. I desperately need Spanish for the work place, and this is the only way I can learn the language! Great course!" ExpertRating is one of the world's only ISO 9001:2015 Certified companies (from TUV America) offering an Online Spanish Course (leading to ExpertRating Spanish Skills Certification). When you choose the ExpertRating Online Spanish Course you can be sure that you are buying a premium International certification that is recognized by hundreds of employers and Government bodies in the US and other countries. With ExpertRating you get certified quickly online and you are equipped with a store house of information through the in-depth ExpertRating Online Spanish Courseware which has been developed by experienced International Language Experts. The ExpertRating Online Spanish Language Skills Certification is by far the best value for money instructor led Spanish Program at $129.99. How much does the Online Spanish Certification cost and what does it include? You can buy this ExpertRating Online Spanish Course leading to Spanish Language Skills certification at a special offer price of only $129.99 which includes the in-depthExpertRating Online Spanish Courseware and exam fee. This is the best value for money Spanish Program available till date. You get the following services within the USD $129.99 fee. In-depth ExpertRating Online Spanish Courseware including scenarios and case studies. World wide airmail delivery of the hard copy Spanish Certificate. The Spanish Skills Certificate can be used to prove your certified status and does not mention the words "online". The process of getting yourself certified is very simple. All you have to do is buy the ExpertRating Online Spanish Course for $129.99. Log in to the instructor led course using your password. Go through the ExpertRating Online Spanish Courseware (which would take you 6 weeks) and complete the final Online Spanish Certification exam at your convenience. You can complete the exam within 2 months of buying the Spanish Certification. The result of the exam appears as soon as it is completed, and your Spanish Skills Certificate is mailed immediately. Chapter assignments to help you practically use the Spanish Skills that you will learn during the Spanish Course. The final exam is fully based upon the ExpertRating Online Spanish Courseware that is provided along with the Spanish Certification. If you have gone through the courseware properly you should not have a problem clearing the exam. The exam consists of multiple choice questions from all chapters of the ExpertRating Online Spanish Courseware. Between 322 and 400 million people speak Spanish as a native language. Spanish is an Indo-European, Romance language and is closely related to the other West Iberian Romance languages. Spanish and Portuguese share similar grammars and vocabulary and a lexical similarity of approximately 89%. Spanish is one of the easiest foreign languages to learn and the Spanish course will teach you the basic rules, words, grammars and help you speak Spanish fast and fluently. The Spanish course would be useful to you if you are planning to work abroad, you plan to move to a Spanish speaking region or if you are interested in Spanish literature. The ExpertRating Speed Spanish Certification gives you a rare chance to learn the nuances of the language and be fluent in it. Just like in English, Spanish sentences are made up of different parts-nouns, verbs, and phrases. In this course, you'll learn how to glue those different parts together using a series of recipes. This first lesson will teach you the Magic Circle Recipe-a recipe so powerful that, by learning 200 vocabulary words, you'll be able to say close to 150,000 sentences in Spanish. Learn a little, do a lot! This lesson will continue to explore the Magic Circle Recipe and will talk about a new one, too: The Hay Recipe. Hay means there is/there are. Think of how many sentences you can say that start this way! You'll also learn some fun Spanish phrases, and by the time this lesson is through, you'll be creating more and more sentences. Now it's time to combine the Magic Circle and Hay Recipes, but a bigger goal of the day is to learn to move quickly from one recipe to another. 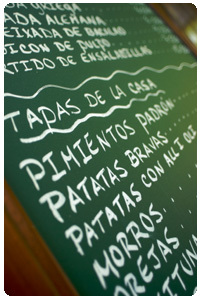 Fluency in Spanish is all about switching from one recipe to another. This lesson will help you get up to speed! In this lesson, you'll move on to the third recipe, the ¿Dónde Está? Recipe. You'll also learn more parts to the Magic Circle Recipe and lots more vocabulary. And you'll take your first giant step toward Spanish fluency by learning everything you need to know to converse in a Spanish-speaking restaurant. In this lesson, you'll practice the three recipes discussed in the previous lessons. You'll also learn adjectives, numbers, and how to tell time in Spanish. And put on your track shoes because it's time for a few speed drills to teach you how to respond quickly with your newly learned Spanish! Since it's a great start to any conversation, this lesson will teach you how to talk about the weather in Spanish. You'll also learn about the seasons, the months of the year and the days of the week. You'll also look at a few more fun phrases and practice some more speed drills. In lesson 7 you’ll travel to a Spanish-speaking country and will be introduced to a man named David Smith. You'll need to learn some travel-related vocabulary and fun phrases for your journey, so this lesson will go over all you need to know. In this lesson, you'll learn the fourth recipe, Tengo/Tiene, and a few related fun phrases. You'll also learn to produce wh-questions-who, what, when, where and why? The major goal of this lesson will be to become quicker in using all four recipes and fun phrases. Is there a doctor en la casa? Lesson 9 will teach you how to discuss physical and mental health issues in Spanish. You'll also learn how to identify different types of clothing. And this lesson will go over many more vocabulary words that you can use with recipes one through four. The fifth recipe is Quiero/Quiere, which means I want/you want. That means you'll learn how to share your wants and needs in everyday Spanish-speaking situations. Also, you've learned a lot of verbs in the previous lessons. This lesson will add a few reflexive verbs to your vocabulary. By learning recipe six, Me gusta/Le gusta, you'll be able to share your likes and dislikes in Spanish-speaking situations. Also in lesson 11, you'll practice recipes one through five, and learn a score of occupational-related vocabulary. ¡Qué Extraño! In this final lesson, you'll learn to speak on the phone in Spanish. You'll also practice how to produce complex negative sentences so you can get mad in Spanish! And this lesson will do one final search for David Smith!